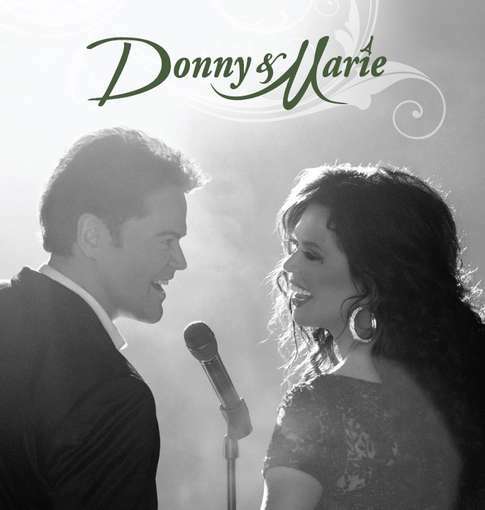 Discussions Magazine Music Blog: An EXCLUSIVE Interview with DONNY & MARIE OSMOND! An EXCLUSIVE Interview with DONNY & MARIE OSMOND! For decades now, the Pop/Rock landscape has been littered with one-hit wonders, disposable popstars and manufactured teen idols that come and go at an alarming rate. While the names and faces have constantly changed over the years, very few of these artists have broken the mold and had a lasting effect on the music scene. The Osmonds are one of those rare acts that have transcended genres, time and space and have become true Pop icons. From their pre-Donny days as a quartet known as The Osmond Brothers in the ‘60s to their massive success throughout the ‘70s, The Osmonds came in many shapes and sizes. There was The Osmonds (Donny, Merrill, Wayne, Jay and Alan) plus Donny’s enormously popular solo career, followed by sister Marie with little brother Jimmy getting in on the act, too. But perhaps the most popular Osmond act was the collaboration between Donny and Marie. From their first appearance on vinyl to their hit TV show, Donny and Marie became the most popular brother/sister duo in music history. (OK, so The Carpenters may have sold more records, but their names and faces are not as instantly recognizable.) The brothers Osmond may have set the stage so many years before, but Donny and Marie brought the Osmond family name into more households than any AM radio was capable of doing. Donny and Marie became the faces of a generation. SPAZ: Your new album is just about ready to hit the streets. How are you feeling about things at this point? MARIE OSMOND: Happy that it’s finally available to the tons of fans who have asked for a new Donny & Marie album….since, well…1980, when I was three years old! DONNY OSMOND: I am very excited about this album. It is one of the most important albums of my career as Marie and I make a comeback. SPAZ: It’s been roughly 30 years since you last recorded an album together. What took you so long and why did you feel that now was the right time? DONNY: It took 30 years for our lawyers to come to an agreement! Marie wanted top billing, but its Donny & Marie - hello! MARIE: After my older brother’s did their 50th Anniversary Celebration tour, which all of us performed at, Donny and I were given the opportunity to do a show for six weeks in Las Vegas. We both agreed to it, thinking that it would be a one-time only type of show. The tickets flew out of the box office and we got an offer to extend for a year, and then another year. Many of the audience members started requesting that we do another album together, so this is for all of them. SPAZ: The album features a slew of great songwriters including a track written by Carol King, Babyface and Carole Bayer Sager. How did you go about choosing the songs for the album? DONNY: We chose the songs based on the fact that they were great songs written by great songwriters. MARIE: Donny & I both put in our two-cents about the songs we’d love to record. There was no shortage of great music to choose from, so we picked the songs we thought went best with that unique sound that is a “sibling” thing, kind of like The Carpenters… you have a more natural blending on the harmonies. SPAZ: There’s a great version of the Country and Pop chestnut, “I Swear”, written by Frank Myers and Gary Baker. You also do a handful of other tracks co-written by them. How did that come about? DONNY: The songs were chosen by three people, Marie, (producer) Buddy Cannon, and myself. We narrowed the list down from 200 songs and "I Swear" made the cut. MARIE: We wanted to record a couple of the big classics, like “I Swear.” Gary Baker played bass and Frank Myers played guitar for years with me when I toured with Country music. In fact, they wrote “I Swear” when they were on the road with my show. I remember when they played it for me, backstage one evening. I said, “That’s a fantastic song.” I tease them now by saying “If touring with me was your muse for that song, then you should have let me record it first!” They are both really good friends of mine. Friends of Donny’s, too, I guess, but they like me a whole heck of a lot more! SPAZ: The album is a true collaboration between the two of you, yet there are moments that are purely Donny and purely Marie. Were there songs that one of you felt strongly about that didn’t make the album because it didn’t musically fit in with the rest of the tracks? MARIE: No, we both got to have our favorites on the album. I was thrilled to be able to record a song that my son, Stephen James, wrote: “I Can’t Wait to Love You.” Buddy Cannon brought us the best possible selections. DONNY: Marie wanted more Marie songs and I of course, wanted more Donny songs. Thank goodness Buddy Cannon was there to be the arbitrator. SPAZ: You both sound great on the album, perhaps the best you’ve ever sounded. Do you still try to challenge yourself, vocally, when you record and perform? MARIE: All of our earlier recordings together were done when we were teenagers. Our voices have definitely matured over the years. We’ve also both done extended-run Broadway shows and tours. We’ve had to stay vocally in shape to keep performing and that’s been a great blessing to me. DONNY: Every album is challenging in its own way, but recording with Marie was a pleasure because our voices blend so well. It's almost like we're related. SPAZ: While the album definitely leans towards a modern Country sound, there are elements of Rock, Pop and Soul on the album as well. What was your mindset when you went into record the album? DONNY: A little bit Country, a little bit Rock and Roll. Wait...that sounds familiar! SPAZ: You have an enormously popular show in Las Vegas. Were you tempted to do a glitzy, Vegasy album before settling on the idea of a Country Pop album? DONNY: You never know how an album is going to turn out until you start making it. The concept, right from the beginning, was to make a record that appeals to a large audience. SPAZ: There’s talk of you taking your show on the road. Will it be doing essentially the same show you do in Vegas or will you be shaking things up a bit? DONNY: The show we perform on the road this year will be a variation of the Vegas show, but from a big picture view, our show at the Flamingo is still the flagship. MARIE: We decided that the new album was a good way to offer something new to the many fans who couldn’t make it to Vegas to see the show. We did a Christmas version of the show on Broadway last December and will take a new holiday version of the show to the Oriental Theater in Chicago this December, as well as New Year’s in Detroit. This summer, the Vegas show tours to Toronto in July for two weeks. SPAZ: How much of the new album are you incorporating into the live show? DONNY: The live show has a way of evolving over time, so more and more of the album will be put into the show as time goes on. Right now we are opening the show with "Vegas Love." SPAZ: While both of you have made albums over the past three decades, how do you feel about the modern recording process? Does it seem easier than 10, 20, 30+ years ago? DONNY: The recording process can change as much as it wants to but at the end of the day, it's the song that matters. As the old saying goes, "If it's' not in the grooves, you don't have a hit record." MARIE: There’s no doubt that new technology has made recording more cost effective. If you have to, you can lay down the tracks instrument by instrument. However, I miss the feeling that there was when you were all together in the studio and recorded live. It’s hard to match the feeling of singing along with the strings, horns, percussion and the musicians all there next to you. It was a more emotion-filled way to record. So now an artist has to be mindful of keeping the true intention of the song when it is produced with modern technology. SPAZ: Most of your chart contemporaries from the early ‘70s have faded from public consciousness. What do you attribute your longevity to? MARIE: Donny and I are both hard workers and I think we understood, early on, right after the ABC variety show, that to have longevity in a career an entertainer needs to be flexible and reinvent themselves and grow. If I do anything that’s unique, it’s that I sing many styles of music: from Pop to Country, Rock to Broadway, inspirational to operatic, which is my latest passion. DONNY: I would like to think that we give our audiences a lot of variety. Many people have told me after seeing our show in Vegas that it's more that what they expected. SPAZ: Much of the Osmonds legacy seems rooted in strong family ties plus the fact that you two, as well as your brothers, have remained very honest, open and down to earth. Would you agree? DONNY: Family is so important. In this business it is necessary to stay down to earth and grounded. MARIE: Our parents gave us a strong work ethic and mutual respect was always a part of that. Donny and I can work with each other five nights a week because of that respect. Our mother demonstrated that love and compassion for your family, friends and fans was top priority and our Dad was a perfect role-model on delivering what you promise to your co-workers and to your audience. DONNY: Enjoy the roller coaster ride. It's going to get bumpy! SPAZ: What’s next for Donny & Marie? MARIE: You can find us in Vegas for this summer and fall, and then on to Chicago for our holiday show at the Oriental Theater in December. MARIE: I have a playlist on my iPod of my favorite songs and they encompass a variety of styles from the 60’s through today. Some of the greats like: “Killing Me Softly,” by Roberta Flack, “Sailing,” by Christopher Cross, Judy Garland, The Bee Gees, Gladys Knight, Barbra Streisand, Garth Brooks, Christina Aguilera, Lady Antebellum, Adele. The stage songs of Kandor & Ebb. Music brings back great memories.